Map of Police Involved Shootings in Dallas, TX (2013-2014). Source. Following the fatal shooting of Michael Brown in Ferguson, MO, there was renewed focus on the prevalence of police shootings in the United States. Yet, as was discovered by The Washington Post and scholars everywhere: No federal agency keeps track of this information, and everything the FBI does maintain is limited to raw numbers on “justifiable homicides.” In addition to being self-reported by police (red flag! ), this purposely excludes instances when suspects were non-fatally injured or simply shot at and missed. This severely undercounts all instances of police involved shootings (PIS). 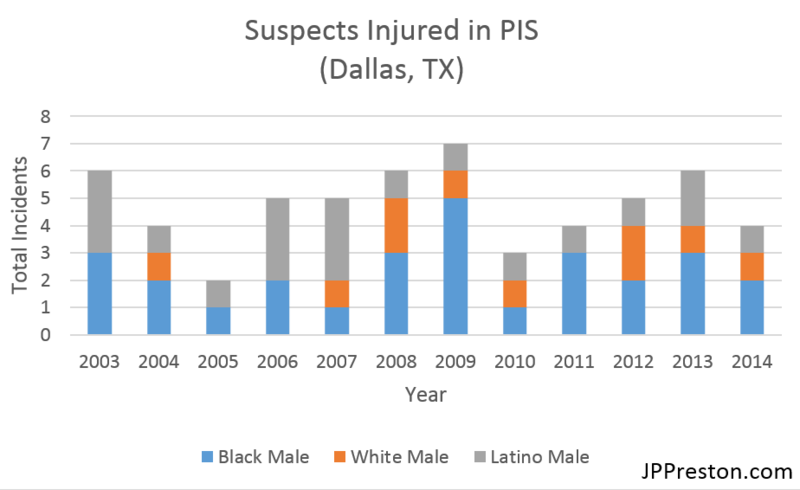 Yet, in a highly commendable move, the Dallas Police Department (DPD) released its self-monitored spreadsheets on all PIS incidents from 2003 to 2014 as part of an effort to improve police-community relations. Amazingly, the data includes demographics not only on the victim but also the officer(s) involved. Rightfully so, it was picked up by local and national media with calls that more departments follow the DPD’s lead. When this release was brought to my attention, the first thing I noticed is that for as rare and rich the DPD’s dataset is, few journalists have actually played with it. The three visuals that exist, which have been copied and shared widely, were made by the DPD themselves — and they’re each pretty similar. Here’s the one that tracks the disposition/outcome of all PIS. 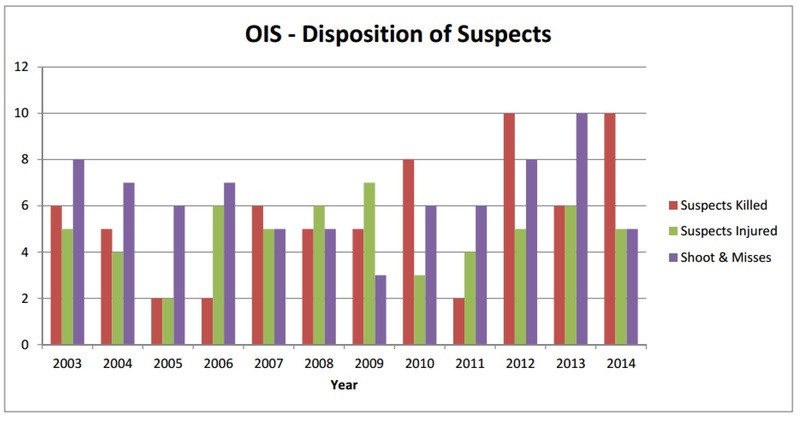 Disposition of Suspects in Police Involved Shootings (Dallas, TX: 2003-2014). Source. By itself, this is a step forward in that it highlights the deficiencies of monitoring only those instances when the suspect is killed (via “justifiable homicide”). In Dallas, ignoring all cases of injury or shoot and misses would eliminate nearly 2/3 of the data. The fact that this is done elsewhere is egregious and unacceptable. For as much as I’d like to praise the DPD, though, there was something else that stood out to me. You’ll note in the above that race appears nowhere, even though for researchers interested in this topic, it’s a key component. This is also the case for the DPD’s other visuals (not published here). To simply say that X suspects were involved in police shootings obscures patterns important to policy makers. So, to fix this, I’ve taken the disposition information and broken each down by race. (Note: In my own analyses I’ve removed all females and Asians because they are practically nonexistent in the data). Suspects Killed in Dallas PIS. Suspects Injured in Dallas PIS. Suspects Shot At and Missed in Dallas PIS. Identifying the race of the suspects presents a whole different picture. For each year in each disposition, black males nearly constitute a majority. This is despite the fact that, according to the U.S. Census, blacks make up only 25% of the city’s population. Next, because the data also includes whether the suspect had a weapon (and what type), we can pull out the race and dispositions of those who were unarmed. 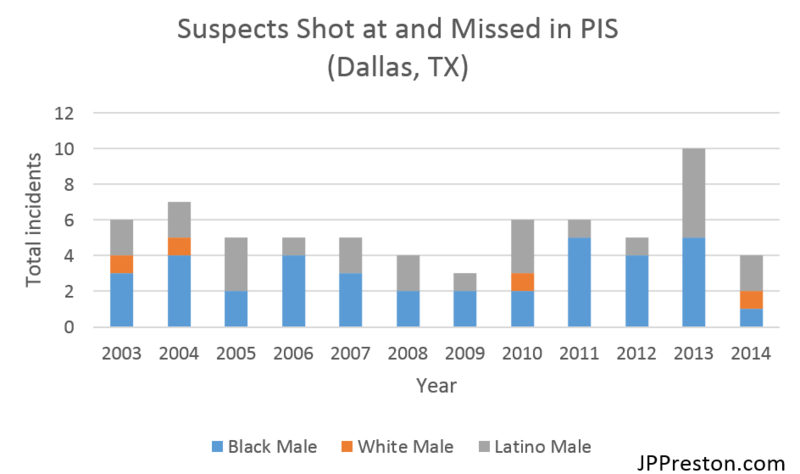 Police involved shootings of unarmed suspects in Dallas, TX (2003-2014). 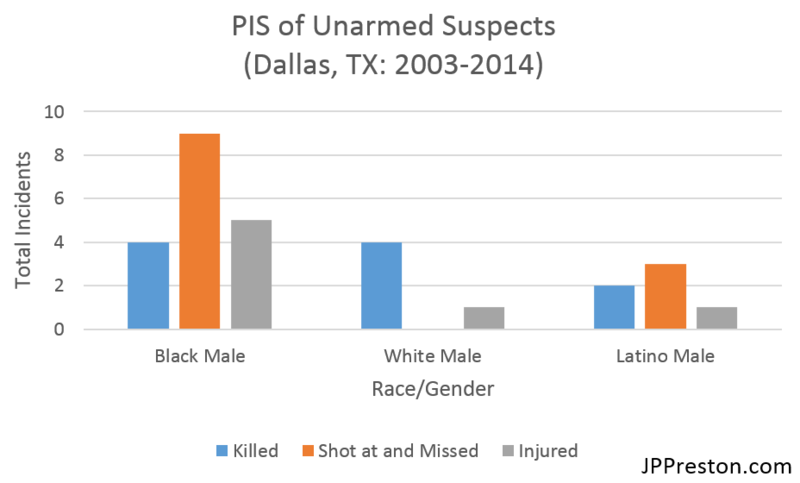 From 2003 to 2014, nearly half of all unarmed men killed by Dallas police were black. Blacks also formed nearly two-thirds of all unarmed shoot-and-misses and injuries. This clearly is not a coincidence. (And no, I’m not the first person to suggest that police shootings have a disproportionate effect on the black community). I want to encourage more journalists and scholars to use this data because until the FBI’s reporting system changes and more police departments release PIS data, we have to squeeze as much as possible out of what’s available. As a researcher at the Initiative on Neuroscience and Law, I know there are plenty of interesting questions to be asked and answered: What’s the relationship between the disposition and weapon and race of the suspect? What effect does the officer’s race have on the disposition? And lastly, What crimes were these suspects allegedly committing? So come on, grad students, get moving. The full DPD dataset can be downloaded from Github (here), though it lacks 2013 data, which will need to be entered manually (or scraped) from the DPD website. Thanks for this useful information. Clearly more data would be good–uniform reporting (as with certain medical diagnoses) would be ideal, but there’s enough here, and in many other reports, to make it clear that persons of color are disproportionately killed and injured by police, especially disproportionately when “unarmed” is part of the equation. Moreover, being disabled and/or mentally ill and a person of color increases the risk factor for maltreatment, including death. The incident this month of a homeless black man in San Francisco attacked by 14 police (someone had reported him “waving a stick”–he had only one leg and the “sticks” were his crutches: persons with crutches may signal with them) or earlier this year of a deaf black man being shot in the back because he was “fleeing arrest” by not stopping when a policeman out of his visual range called to him to stop, the several deaths in Texas of unarmed mentally ill persons shot dead (one while in a wheelchair–the “gun” was a ballpoint pen) are clear proof that the system is badly flawed. The bias starts early. In recent research study involving students from preschool through high school in a large metropolitan area (not Dallas), both race and class were shown to affect disciplinary decisions for the same types of infractions: black (and other poor) students were suspended or expelled in situations where white (and especially upper-middle class white) students were “counseled” with their parents. They are perceived as looking older and larger than non-black students the same age (relevant to recent shooting situations–such as the shooting of 12 yo Tamir Rice…who sure looked 11-12 to me) and as being aggressive and/or armed in situations where they are not. It is no wonder that black people expect maltreatment, sexual assault, and death at the hands of police. Actually you are interpreting that data wrong. 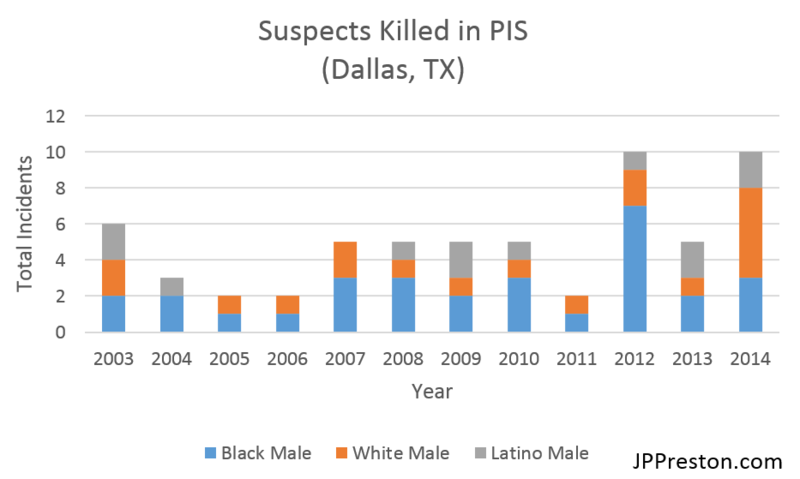 Those graphs clearly show that there are far more Hispanic and White people killed by police in Dallas than Black people. If I am reading it correctly it says in 2003 there were 6 Hispanics, 4 Whites, and 2 Blacks shot and killed by Dallas Police. The only place in your data where Black people equal White people is the number of unarmed suspects shot and killed.